TruPosture - World's 1st Posture Training Smart-Shirt uses multi-sensors. Train and Strengthen your back muscles and core for a good posture and healthy spine naturally. Monitor your entire spine and posture in real-time. Improve your environment at Home, the Office, or Car for optimal ergonomics. Wear the lightweight TruPosture Smart Shirt discretely and comfortably under your regular clothes and train for a good posture at work or at home. Start your training by simply setting your Reference Posture & let the TruPosture Smart Shirt monitor your posture & remind you with a gentle vibration when your posture is off. 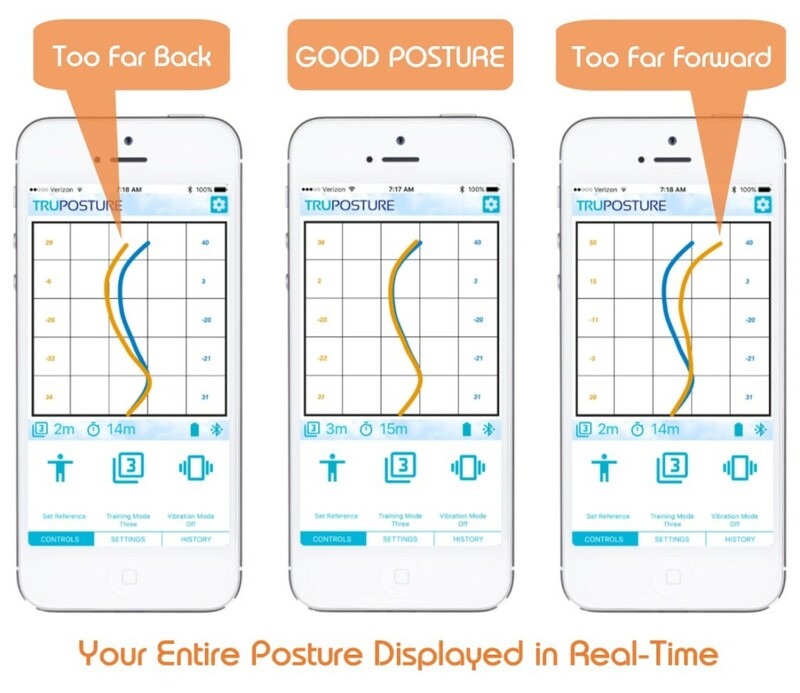 Download the free TruPosture App on your Smart Phone, Tablet or Computer and use it to monitor your posture in real-time. 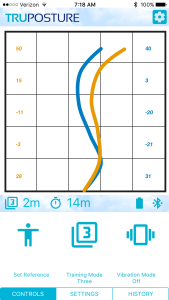 The BLUE curve represents your Reference Posture, and the Orange curve your actual posture. 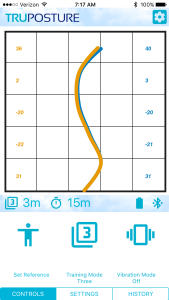 Use the App to customize your training level, duration, and interval cycle, and access other features. The TruPosture Smart Shirt is Self-Contained and will run without the need to connect to a smart phone or computer. “…I never knew how much time I spend bent over or leaning forward on my computer, notice that this has been the root source of my middle back between the shoulder pain. This TruPosture sleeveless which I put on when I get on my computer has been keeping me sitting upright and shoulders back. 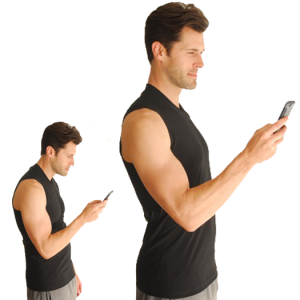 If you are dealing with back pain or neck pain, or if your PT recommends adjusting your posture to help your condition, then the TruPosture Smart Shirt is a device you should consider. TruPosture’s best asset is its software. The shirt pairs with an app to show users actual diagrams of their spine. Very soon we will be able to monitor in real time our spine to detect and correct posture problems. No, not science fiction, but yet another brilliant idea from the pages of Indiegogo. What’s nice is that if you can’t sync the device to your smartphone, it will prompt you independently by sending vibration feedback if your back is in a crooked position. If you want to pair it with your favorite fitness/health tracker you can do that as well. Are you sitting a little straighter now?